Deleted an important email by mistake? Don’t panic. Here’s How to recover deleted emails on your iPhone or iPad. I just deleted an important email in iOS Mail. Can I recover the deleted email? Help! Don’t worry! It’s very simple to retrieve a email you’ve accidentally deleted from Mail on your iPhone or iPad, provided you do so reasonably quickly. (Within a week is the default, but you can change the length of time Mail waits before permanently deleting ‘deleted’ emails.) In this article we explain how to recover mistakenly deleted emails in iOS Mail. You may or may not know about iOS’s undo gesture, because Apple barely publicises it. But it’s a useful and widespread function. If you do something you regret, no matter which app you’re in, it’s worth giving your iPhone or iPad a quick (and gentle) shake – just a single flick should do it – to see if that app has the undo gesture baked in. If it does, a dialogue box will pop up and say something like ‘Undo Delete’. 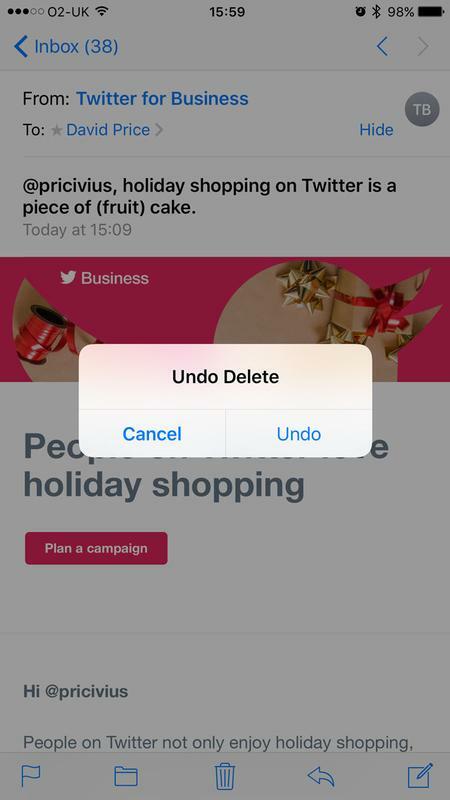 Tap Undo to reverse the previous action or Cancel if you made the gesture by accident and don’t want to undo anything. Naturally undo gesture support will most commonly feature in Apple’s own apps. Including, fortunately for the purposes of this tutorial, Mail. Which brings us back to the original scenario: you’ve just deleted an important email by mistake. If you’re prompt, you can get it back very easily. Just give your iPhone that gentle but firm flick/shake and you should see the undo message. Tap undo and the email will be recovered. But where does the recovered email go? If you had the email open when you tapped the dustbin icon, and it whooshed off into the digital ether, leaving you looking at the next email in the queue, this might seem mysterious: iOS doesn’t bring the recovered email back on to the screen. But it’s been put back into the inbox it came from, so don’t worry. Tap Inbox, or Mailboxes, or the back chevron, or whatever control takes you out of the email view and back to the inboxes, and you’ll find the recovered email in no time. It’s worth pointing out at this point that the undo gesture is a single-step undo. You can’t flick to undo one action, then flick again to undo the action before that: if you flick a second time you’ll do a redo instead. This is useful if you change your mind about the undo, but prevents you from going back multiple steps. If you’ve moved on since deleting the email, we’ll need to look into more advanced solutions. The next method is appropriate if you don’t recognise at once that deleting that email was a mistake: if you perform another action in the Mail app so that the undo gesture is no longer able to reach back far enough to undo the deletion. In this case you need to actively seek out the temporary holding folder where Mail keeps emails that have been designated for deletion, but haven’t yet actually been deleted – an action which iOS will perform after waiting (by default) one week. If you’re using a Hotmail account, for example, tap Hotmail at the top left (or a backwards chevron) to go back to the accounts/inboxes menu, then scroll down to find the section headed HOTMAIL and tap Trash. Find the deleted email and open it, then tap the folder icon at the bottom (between the flag icon and the bin) and then select the Inbox – or another active folder – to send it to. Gmail or a Gmail-based corporate mail setup is a little different: you don’t delete emails in those systems, you ‘archive’ them’. The easiest way to see your archived email is to open the All Mail folder. Once you’ve found the deleted email, tap it to open the message, then tap the folder icon at the bottom and send it back to the Inbox.